Our voices carry farther than ever before, thanks to digital media. But how are they being heard? In this book, Damon Krukowski examines how the switch from analog to digital audio is changing our perceptions of time, space, love, money, and power. In Ways of Hearing—modeled on Ways of Seeing, John Berger’s influential 1972 book on visual culture—Krukowski offers readers a set of tools for critical listening in the digital age. Just as Ways of Seeing began as a BBC television series, Ways of Hearing is based on a six-part podcast produced for the groundbreaking public radio podcast network Radiotopia. Inventive uses of text and design help bring the message beyond the range of earbuds. Each chapter of Ways of Hearing explores a different aspect of listening in the digital age: time, space, love, money, and power. Digital time, for example, is designed for machines. When we trade broadcast for podcast, or analog for digital in the recording studio, we give up the opportunity to perceive time together through our media. On the street, we experience public space privately, as our headphones allow us to avoid “ear contact” with the city. Heard on a cell phone, our loved ones’ voices are compressed, stripped of context by digital technology. Music has been dematerialized, no longer an object to be bought and sold. With recommendation algorithms and playlists, digital corporations have created a media universe that adapts to us, eliminating the pleasures of brick-and-mortar browsing. Krukowski lays out a choice: do we want a world enriched by the messiness of noise, or one that strives toward the purity of signal only? Damon Krukowski is a writer and musician. 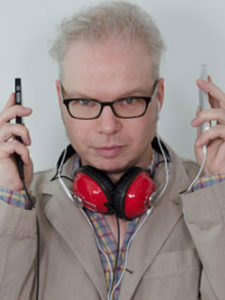 Author of The New Analog: Listening and Reconnecting in a Digital World, he has taught writing and sound (and writing about sound) at Harvard University. He was in the indie rock band Galaxie 500 and is currently one half of the folk-rock duo Damon & Naomi. He lives in Cambridge, Massachusetts.